An 88% waning gibbous moon nears its set above Mt. 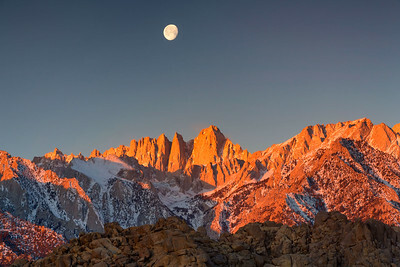 Whitney (highest summit in the contiguous United States at an elevation of 14,505 feet) as morning alpenglow lights the peaks of the eastern Sierra crest. Alabama Hills, Lone Pine, California, USA. Morning aplpenglow illumintaes the peaks behind North Lake at 10,000 feet on the eastern side of the Sierra-Nevada range, California, USA. Alpenglow light on Mt.Conness above Tanaya Lake, Yosmeite National Park, California, USA. Dawn colors reflect into Mono Lake as seen from Black Point. Mono Lake's high salinity is over two times higher than our oceans. Eastern Sierra, California, USA. 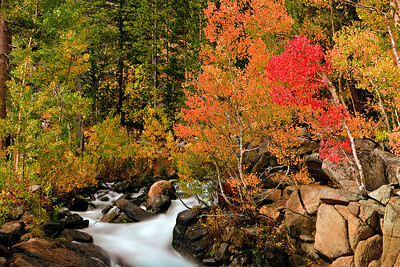 A rare red-colored aspen sits amongst other trees in various stages of fall color along the middle fork of Bishop Creek, Bishop Canyon, California, USA. 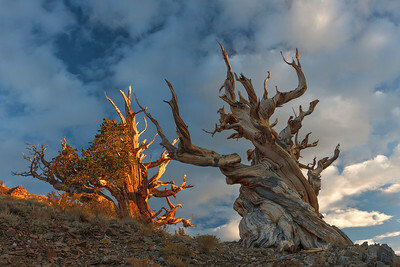 Old-groth bristlecone pines, estimated to be more than 4,000 years old, bask in the last light of the setting sun in the Schulman Grove, White Mountains, California, USA. An ancient bristlecone pine, determined to be over 4,000 years old, stands a lava schaled hilltop at 10,000 feet with the galcial fields of the eastern Sierra serving as a backdrop. Schulman Grove, White Mountains, California, USA. An old-growth bristlecone pine, estimated to be over 4,000 years old, basks under a night sky at 10,000 feet elevation in the Schulman Grove of the White Mountains, California, USA. THis was a 30-second timed exposure with the bristlecone lightpainted by my headlamp. An early fall storm deposits the first snow near Mt. Tom near Bishop, California, USA. A cloud hugs the tip of Clouds Rest, Yosemite National Park, California, USA. A full moon sets over the eastern Sierra crest near Mt. Whitney from the Alabama Hills, Lone Pine, California, USA. 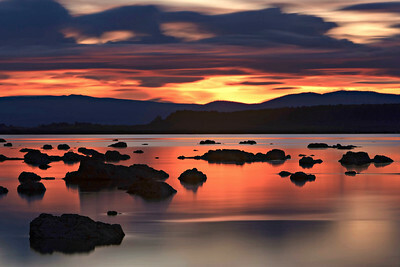 A vivid fall dawn sky reflects in the still waters of Mono Lake, California, USA. Tufa rocks formed by a combination of cacium from mountain creeks and carbonates on the lakebed. This was a three-minute timed exposure captured 30 minutes prior to sunrise. A vivid twilight wedge forms below a rising moon with a withering bristlecone pine. Patriarch Grove, White Mountains, California, USA. Sunrise light skims the otherworldly rock formations of the Alabama Hills, Mt. Whitney, and the eastern Sierra crest, California, USA. 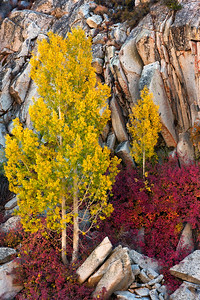 Fall color enlivens aspens and foliage at North Lake above Bishop, California, USA. Fall evening hues paint the still saline Mono Lake as tufa (calcium-carbonate) formations dot the landscape. Lee Vining, California, USA. An early fall storm deposits the first snow atop Mt. 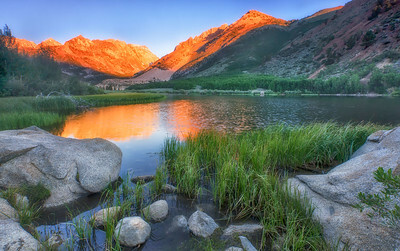 Tom, elevation 13,104 feet, located in the eastern Sierra west of Bishop, California, USA. A firey dusk sky hovers over tufa towers at Mono Lake, near Lee Vining, California, USA. Tufa is formed by calcium-rich streams mixing with the carbonates risiding on the lake's floor. Mono Lake averages 57 feet with a maximum depth of 159 feet. Fall color and alpenglow light hits the 14,000 foot peaks above Lake Sabrina, Eastern Sierra, California, USA. Joshua trees dot the landscape east of the Sierra Crest and Mt. Whitney, Inyo County, California, USA. Half Dome is lit by a setting sun as seen from Olmstead Point, Yosemite National Park, California, USA. A moon rises over vivid twilight wedge at dusk as seen from the White Mountains' Patriarch Grove. Old-growth bristilecone pines, some as old as 5,000 years old, line the shale-covered hillside. Patriarch Grove, White Mountains, California, USA. Alpenglow lights Mt. 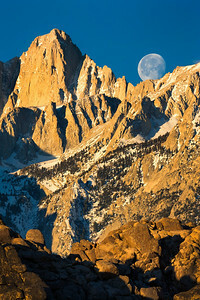 Whitney (elevation 14,499 feet) as a full moon sets over the eastern Sierra crest, Alabama Hills, Lone Pine, California, USA. A full moon sets behind Mt. Whitney (elevation 15,505), Alabama Hills, Lone Pine, California, USA. Warm morning light bathes clouds and mountains of the eastern Sierra range and regflects into the calm saline waters of Mono Lake near Lee Vining, California, USA. The white rocks are tufa formed by a combination of calcium (from nearby streams) and carbonate on the lakebed. A 30-minute exposure allows for star trail atop Mauna Kea, Hawaii, USA.